From Tenyo, it's Burglar-Ball, the break-in mystery! 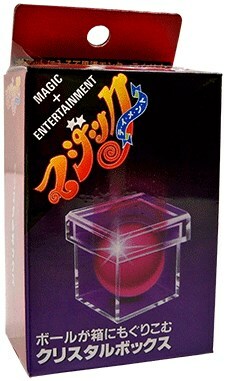 An amazing magic trick featuring a solid clear box, a solid clear cover, a solid ball and a rubber band. Everything can be examined before and after the miracle. Place the cover on the box and secure the whole thing with a rubber band. Cover the box with a handkerchief, and place the ball under the hanky, on top of the box. Now comes the magic. Your audience will see the ball sinking into the box. Remove the handkerchief and the ball is really inside the box. The ball is removed and the spectator can examine all the props.